Koh Rong Samloem is really a beautiful Island, one of the most beautiful island in Cambodia, but you can also discover the mainland as Sihanoukville and other best places and attractions to visit in Cambodia! When you think of the coast and the sea of ​​Cambodia, it is natural to think of Sihanoukville. Yet the recent history of this city has a tourist destination, but commercial. The modern Sihanoukville was in fact created by the need for Cambodia to have a port to replace Kampot, until then the country’s main port and center of trade with Singapore. The queen was Kep as a tourist destination, located near the border with Vietnam. Today, things have changed quite a bit, Kep struggling to recover after decades very difficult, as well as being Sihanoukville port has also become a place of destination for tourists, especially after the opening of the border post near Koh Kong. The dual personality of the city breathes in deeply, unattractive and a bit ‘”shady” like many port cities, but plenty of accommodation and restaurants for tourists attracted by its beaches. 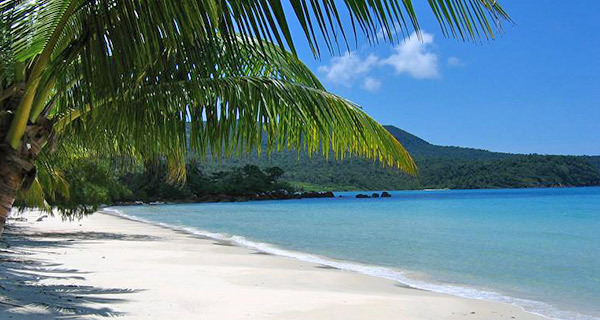 Missed once in Sihanoukville is a visit to the islands, a true tropical paradise. rts and hotels. The numerous guesthouses in the area date back to when this beach was a place much loved by tourists DIY. From this beach you can watch the sunset and is located near the center of the city’s nightlife. Hawaii Beach (Lamherkay Beach): Very popular with Cambodians, this beach, also called King’s Beach, is located just south of Victory Beach. Along the coast there are many pine trees give shade, there are many restaurants but no chance of accommodation Hawaii Beach is located near the bridge leading to Koh Pos (Snake Island), also they depart from this beach many boats bound for the various islands . Sokha Beach: Perhaps the most attractive and most popular of the city, was privatized with the opening of Sokha Beach Resort, a resort offering luxurious accommodation. A crescent of white sand about 1.5 km long, well-maintained and not very crowded. Paying the ticket provided you can also access to a pool, use the fitness center and relax in the lounge. The gazebo and beach bars are managed by the resort. Independence Beach (Brampul-Chann Beach): One of the quieter beaches and closer to the city center, almost two kilometers of sand without many facilities, in the southwestern part of the city. Part of the beach has been privatized and is now run from Independence Hotel Complex on the one hand and from the Holiday Palace Casino on the other, the remaining part of free access is about 500 meters long. A beach suitable for those who want to escape the crowds. Occheuteal Beach (Chnay Occheuteal): Maybe the best beach of the city, certainly the busiest. The sand is mostly home to locals and tourists staying in nearby hotels, and is shaded by many pines. Along the 3km Occheuteal Beach are numerous restaurants that offer the possibility to rent sunbeds and umbrellas. Just five minutes walk from the center. Serendipity Beach: This is the part north of Occheuteal Beach (200m long), rocky and often very crowded by tourists. Here there are many facilities such as umbrellas and chairs but plenty of bars and restaurants right on the beach. Also because of the many guesthouse present, the night this area can be very noisy. How Occheuteal Beach also Serendipity Beach is narrow but easily accessible. Otres Beach: Located outside the city, in the far southeastern edge of Occheuteal Beach, this beach is the one that is growing faster than in the city. Formerly frequented by those who wanted to escape the crowd, today sees multiply the bungalows and facilities for beach life. Growth was also favored by the construction of two new roads and the arrival of electricity. The sand is white such Occheuteal, but here the atmosphere is more relaxed. Hun Sen Beach (Prek Treng Beach): Located a few kilometers after the port, north of the city, this white-sand beach with some rocks is often deserted, also it lacks facilities. So bring everything you need. Ream Beach (Chamkar Doung Beach): Located 27km north of the city, this beach is located inside the national park, is not touristy and the quality is not very high. The beach is long and narrow, a mixture of dark sand and gravel. Kos Beach Pos: Managed today by the Treasure Island Restaurant, this small beach shaded by water but not beautiful, is located in the western end of Sihanoukville. Central Ocheteaul: Proceeding to Otres Beach, this beach is located about 2 km long, behind the golf course ever built. Central Ocheuteaul is the way to walk Otres Beach. South Ocheteaul: It is 200 meters from the beach ending the rocks near the bridge over the river. Beautiful and quiet enough hosts some restaurant on the beach. After crossing the bridge you will be at Otres Beach. 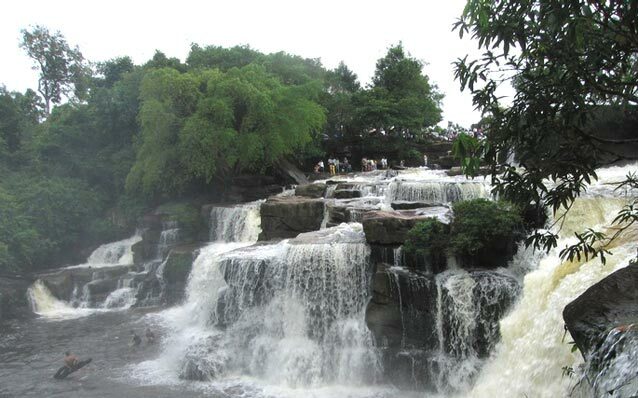 Kbal Chhay Waterfalls: Located 17 km away from Sihanoukville, these falls are not missed. However are a stage much loved by Cambodians, to the fact that here was shot one of the most famous films produced in Cambodia. Wat Leu: One of the five most important wat Sihanoukville, this temple, also known as Wat Chotynieng, stands on a hillside at 6km from the city. Surrounded by forest Wat Leu offers wonderful views of the islands. Wat Krom: This temple, also called Wat Utynieng, is one of the most popular attractions in Sihanoukville. Located 3 kms from the city, it has interesting architectural elements. The temple is dedicated to Ya-Mao, a local deity. Stung Hau: It is a fishing village 23km from Sihanoukville, north of Hun Sen Beach. It is not very frequented by tourists, here you can get in touch with the daily reality of the families of local fishermen. Water Park: The only water park in Sihanoukville, he slides 12 meters high, a large swimming pool and other games. Here you can also taste their barbecue or buy souvenirs in the small shop. Ream National Park: This park is also known as Preak Sihanouk National Park, was established in 1993 and is home to numerous species of animals such as apes, dolphins and eagles. You can make educational boat trips. Sihanoukville offers so much when out of the city center, and what you expect? A wonderful natural environment awaits you!